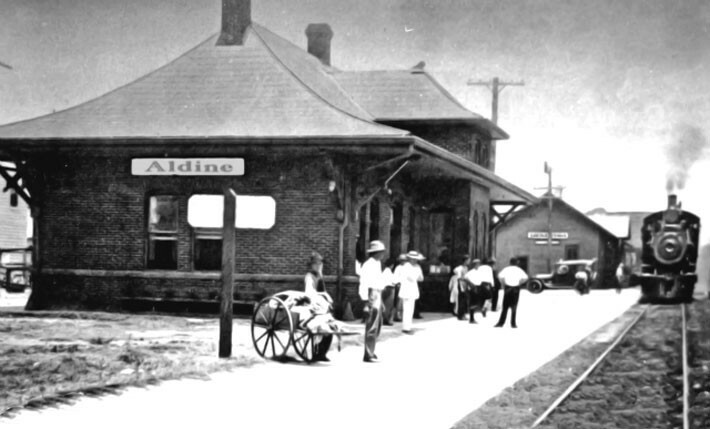 Photograph of the Aldine railroad station. Image available on the Internet and included in accordance with Title 17 U.S.C. Section 107. ALDINE, TEXAS (Uvalde County). Aldine is on Farm Road 1051 and the Dry Frio River two miles north of the junction of U.S. Highway 83 and Farm Road 1051 in north central Uvalde County. A post office operated there from 1885 to 1891. Some of the original settlers around 1880 were the Mousers, the Blakneys, and Josh and Billy Cox. The land used for the Aldine school and cemetery was donated by Cox. In 1900 the school had twelve students and one teacher. The school and a scattering of dwellings were at the site in 1946. By 1971 the school had been abandoned, and all that remained of Aldine by 1988 was the cemetery. Handbook of Texas Online, Ruben E. Ochoa, "ALDINE, TX (UVALDE COUNTY)," accessed April 26, 2019, http://www.tshaonline.org/handbook/online/articles/hra90.